AT jumped at the offer to attend the launch of Elandra, not just because of the headline act Grace Jones, but because the Mission Beach locale is one we believe you’ll be hearing a lot about in the coming years. The Elandra has been known by many names in its 20-year history. Originally the resort was called The Point, then later The Horizon. 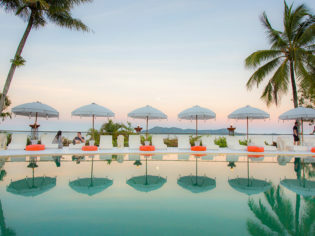 Pool time: Elandra resort, Mission Beach, Queensland. In July 2007 it was bought by Katrina Knowles and her husband Adam Karras for $9.25 million. The Knowles family are the people behind the Australian Retirement Communities and sit comfortably at No. 26 on BRW’s Rich Family list. Katrina says her vision is for the “safari by the sea”, with influences from her travels in India,Indonesia and Africa infused in all of the rooms and the resort as a whole. In choosing to refurb the resort, rather than knockdown and start again, Katrina is limited by the existing structures. This presents no problem for the main public areas. The lobby, restaurant and pool area were well done from the beginning, so adding Katrina’s touch with co-interior designer Jean Pierre Heurteau has produced a stunning result. The pool deck is impressive, with the view out DunkIslandspectacular. It’s a memorable way to be greeted and is reminiscent of arriving at Qualia on Hamilton Island. The chandelier at the entrance to the resort is an example of Katrina’s touches that may well be overlooked or unappreciated by the casual observer. It’s a spectacular array of antlers and horns that Katrina gave to Melbourneartist Mark Douglas to arrange into a chandelier. King suite: Elandra resort, Mission Beach, Queensland. The walls of the restaurant are adorned with doors from the huts of the last headhunting tribe of northernIndia, the Naga. The carvings on these doors were signs of their wealth and feature ghoulish skulls and other ostentatious displays of pre-historic wealth. The refurbishment of the rooms presented Katrina with more of a challenge as the entire resort was built for the ‘80s. Structurally, the single rooms are small with low roofs and bathrooms considered tiny by today’s standards. Working within these confines, the Elandra rooms are beautifully appointed with some amazing finishes. For example, the bathrooms have amazing handcrafted and polished granite stone bowls. Impressive, if not slightly impractical when trying to shave. Time to dine: Elandra resort, Mission Beach, Queensland. Each room is appointed with different features and furniture. The Naga tribe artifacts made an appearance above AT’s bed, while another guest spoke of the intimidating animal head above her bed. A larger room with more space had a fine Nigerian beaded mask on the wall, and a spectacular woven chair in a corner. It’s these touches that make the Elandra imminently interesting and cozy. The only disappointment is a big one, yet easily fixed. The food at launch wasn’t up to scratch and needs to be immediately dumped and started over. It was striving way too far for what’s possible in the tropics. The best example is the crocodile – dangerously raw, chewy and tasteless. The kangaroo kofta was interesting, if as dry as the land from which it may have come. It seems the chef needs to review a few of Ramsay’s Kitchen Nightmares and get some tips. Providing world-class food in a place like Mission Beach is incredibly hard. The challenges of fresh produce are very difficult and you really need to start with the basics and grow from there. The fit-out was yet to be finished and the disappointment in Katrina’s eyes for having the place 85 percent ready at launch was evident. She’s expecting another container to arrive this week (June 30) to finish with the camel bone mirror frames and other wonderful fittings. Even so, the Elandra is truly boutique with a great personal touch that reflects the proprietors’ taste. It’s a stylish hotel that won’t break the budget – at a rack rate of $240 per night it’s good value and perfectly suits couples looking for relaxing, stylish digs in an exotic destination with loads of privacy.